As readers will know, Jen is really disrupting sleep in this house. We’ve been trying different routines and reward charts to give him more bedtime structure and this is helping a little. Jen’s most annoying bed time habit is refusing to go to, or stay in his bed a whole night. He was OK when still in nappies, and stayed in his bed until daylight. Since Jen has been mostly dry in the daytime its been loo before bed and a waterproof plastic under sheet, with accidents still happening at night. He hated that noise so much, the hot and sweaty crinkly sounding sheet. I think trying to be prepared did more harm than good in his case. Which brings me round to Brolly Sheets. It’s a bright bed pad that you put over an ordinary cotton bed sheet but just at shoulder to knee area on the bed, no need to protect toes from wee issues. You just tuck the big wings under the sides of the mattress. If little one does wee in the night you just change their pjs and pull off the Brolly Sheet, the normal bedding is all still in place under where the Brolly sheet was. Bung the sheet and the pjs in the washing machine, no drama at all. Brolly Sheets have been lovely, I have been in contact with them and they’ve sent me two sheets. One in blue, one in a funky lime. One says MINE one says TO SHARE. Jen wanted the lime to my surprise, which means the blue one will be given away on my blog. 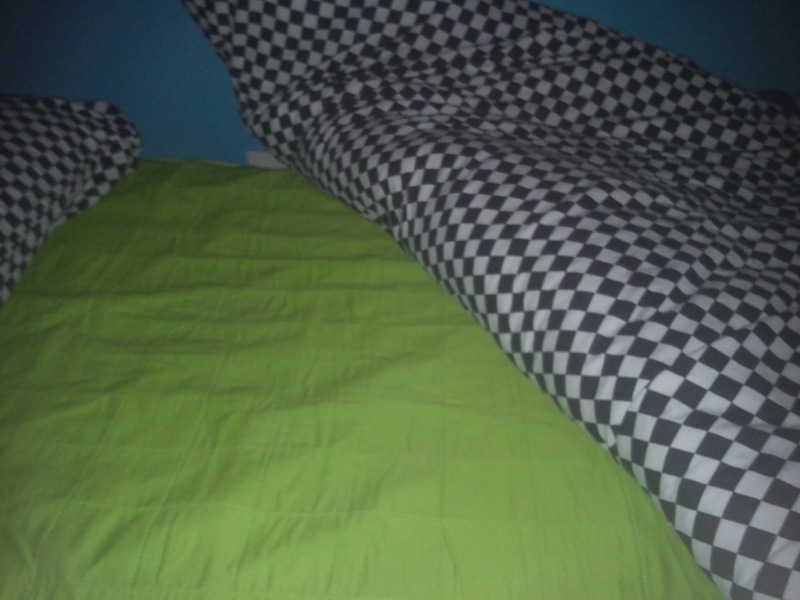 Here is the lime green Brolly Sheet on Jen’s bed. It’s a “box” bedroom I’m afraid, so the lighting is poor! His duvet and pillow match his personality, he loves cars. 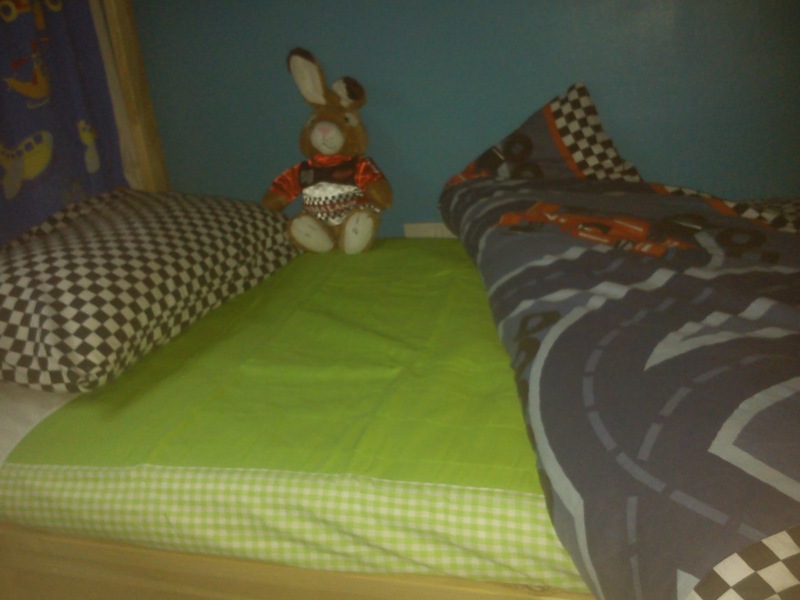 Although you can’t see it in this photo there is a lime green racing car on his duvet that matches his new sheet. In the background you might notice Racing Bunny… Yes even his teddies are petrol heads. With any luck this bed combo will see him going to sleep super fast! Unfortunately Saturday morning was another wet bed. The Brolly Sheet worked. Mattress and white sheet were still dry! The quilt was a bit damp but Jen does fidget and wrap the quilt underneath himself. 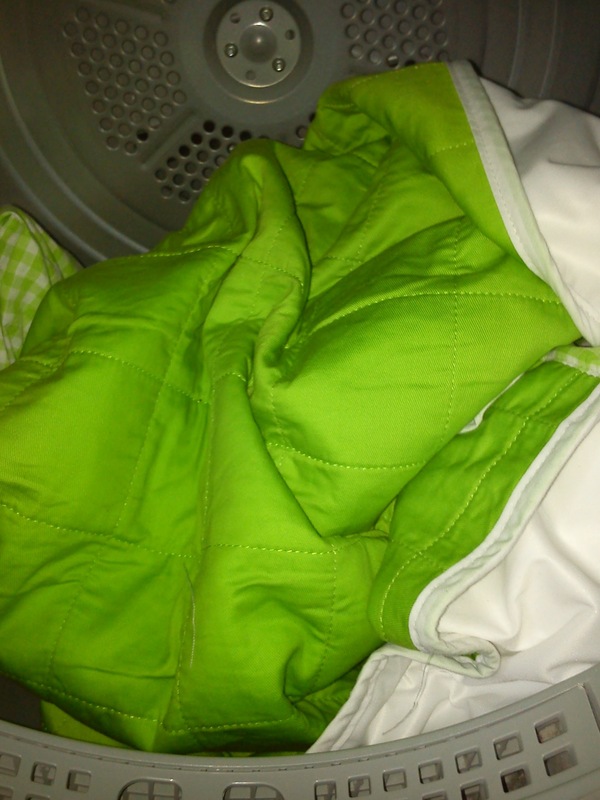 Washed and in the tumble, low heat only but it is very helpful to be able to dry it quickly. 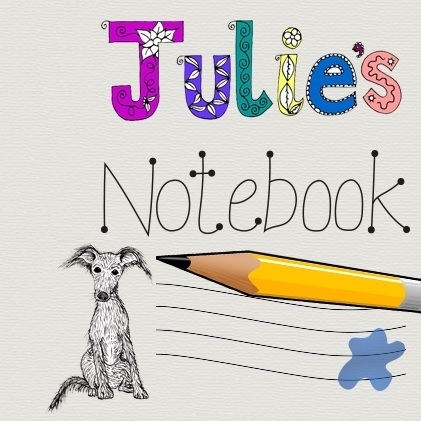 I really liked this, and I was surprised that Jen chose the lime coloured sheet, which means I have the blue to give away to a parent, Grandparent or Carer. A good thing about these bed pads is they are easy peasy to use. It means that underneath his bum and body is a slightly padded area, sandwiched between soft cotton and a waterproof layer. This makes it feel comfortable to lie on, no crunch noise like old fashioned plastic sheets, also it is considerably nicer looking. I am going to be taking this when we go away camping, I remember the last camping trip, Jen wet the bed. As we were camping that meant taking an inflatable bed out of the tent and hosing it off in front of other campers, then laying it over the roof of our car to dry, a teeny tiny bit embarrassing that was. With a damp brolly sheet I could just pop it in a bag and go to a laundrette. For anyone else struggling with night time accidents it might be worth checking out ERIC website which is all about incontinence issues, including bed wetting. Brolly Sheets come in various colours, and not just for single beds either. Disclosure : I was sent a Brolly Sheet for me to review. My opinions are still my own. bed pads are a lifesaver! Welcome Rebecca! Nice to have you here, good luck, and cute avatar photo. I used to try and make a game of potty training, and not make any big thing about any little mis-haps. it seemed to work for me. If my girl wakes in the night I always take her to the loo though I don’t wake her to do this. Oops forgot to leave my tip. Don’t be sorry. it’s ok.
patience, never get mad when theres an accident makes it more daunting for the child and probably more likely to be another accident. loads of praise when they use the potty. as for bed wetting. bed pads are a god send. but never give the child a drink an hour before bedtime. my daughter has only wet the bed once. I think the key to potty training is patience! We’re just about to begin potty training so no advice yet but this would be very useful! I doubt I can give any good tips as I started with Ry 14 months ago and he still has two accidents a day!!! But I can recommend the Potette – it’s brilliant as a potty and a toilet seat, and folds flat to pop into a handbag! I didn’t try potty training until my son was completely ready, then he managed it in two weeks, day and night! Perserverance and patience are key! Waterproof sheets and just have patience and reassure the child that they have not done anything wrong which could make it worse! Patience, patience, and more patience! My advice is go with your child’s lead, we are so keen sometimes as parents to be competitive and we don’t watch for signs from our kids and with either miss the start point because we weren’t listening or we push too early making it hard for everyone! Patience, stickers and a glass of wine once they have settled in bed!! Try to not give you little one a drink at least an hour before they go to bed and get them to have a wee just before bed too. Haven’t really got any as we haven’t acheived it yet. Trying to hold my nerve until H is ready, but most of his contemporaries are dry at night already. Hoping waiting till he is ready will make it easier. 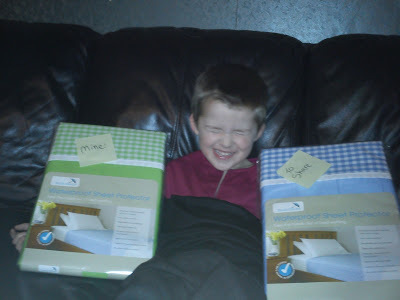 Bed Pads – saves the mattress! So glad I took Jens brolly sheet with us this week. He was wet 3 nights out of 4! Each morning I’d wash it in our caravans shower. Then hang it up to drip and onto the central heater in evening – we managed ok. Without it we would be looking at a cleaning bill. Don’t rush them, they will do it in their own time, I think the more you push potty training,the less likely they are to do it! 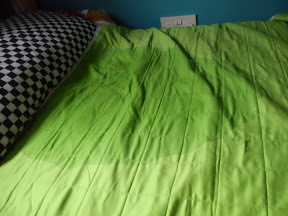 my bed wetting tip is for the parent rather than the child. It’s ‘Be patient’! You rarely hear of grown ups who still wet the bed so just remember that they will get there in their own timeand don’t panic when they have accidents. Potty training – find a good two weeks, like half-term, and ideally in the summer. Let them run around so they can go to the potty easily, and do it intensively over 2 weeks, and by the time it’s over, all done and dusted! My son is autistic so my advice would be pics of the process in the bathroom so he understands what to do.